I was looking high and low for a seat cover durable enough for my dog and the Carhartt name & reputation sold the product. Initially, i am disappointed by the fit on my 2014 GMC double cab rear split bench. 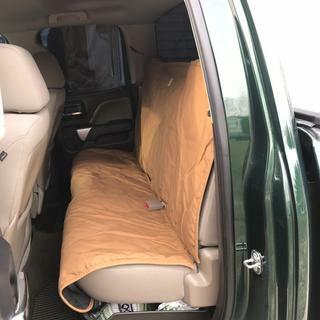 The back portion of the seat cover is longer than the seat is tall which i would think is better (complete coverage) but the only way to secure the cover is two adjustable straps located along the top edge nearby the headrests. The belt openings therefore don't match up with their actual location, the seat bottom itself is not secured by any means and i'm not prepared to put my kids or my dog on it quite yet. Thinking of practical ways to better secure it. Carhartt will have to reimburse me for the ideas ;-). The material is classic Carhartt duck canvas. I imagined it to be heavier overall, but I believe it will be sufficient. Seat cover has Carhartt quality but is too small for my Dodge Ram pickup, plus it desperately needs a better way to fasten the cover to seats. This thing slides around all over the place on leather seats which makes it basically useless. On top of that this cover is too small for the seat in my truck leaving approximately 3 inches of exposed seat on each side. We appreciate your input and are sorry this didn't meet your needs. Please contact us at 1 800 833 3118 with any questions. He was very happy to receive this, so he can bring his puppy with him, which they both love doing together. 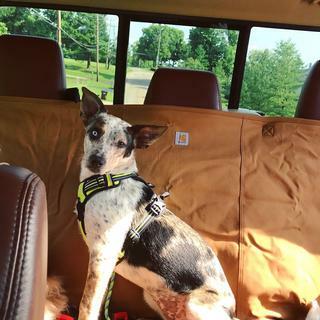 It protects his truck seat, and there's no puppy hair. Not sure about the durability yet, but I haven't heard any complaints. Carhartt is know for good quality. Need a better way to fasten bottom of cover. Love my carhartt seat cover and so does my Siberian Husky! The material is obviously top quality but it was a little small for my crew cab ram. The seat didnt secure to the bottom either so it just slides around the leather. I returned it. Doesn’t cover the whole seat in my 2014 ram. Should have been at least 4” longer and maybe even more so it would hang over the edge of seat for more protection. It’s 2” from the edge of seat on both sides. The quality was exactly what I expect from Carhartt. On that part it is perfect. However, the length of it is shorter than I thought it would be. I have it for my Dodge Ram and it’s is short on both ends by about an inch and a half. It’s made more for a small SUV, not a truck. Brought this to protect the seats in my truck from mud and hair from my dog and also any damage from his nails to the upholstery. My truck doesn’t have head rests but we quickly worked out that the cover fits great if turned upside down! Really pleased with the fit, drove from NC to AK with the dog in and out all the time, cover never shifted. Easy to brush the dirt off. Would definitely recommend. The cover itself is very nice and durable. What it is lacking is straps to secure it from the rear toward the front under the seat to keep it in place. I will be attaching Velcro straps to do that. As it is now- it slides forward. My boyfriend and I have 2 dogs that we take everywhere we can. We were sick of using blankets because they’d slide off the seat when the dogs would move. 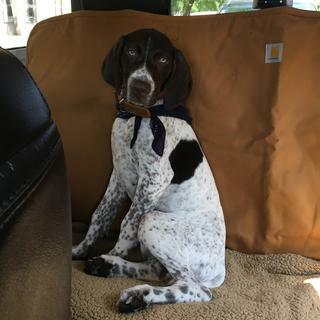 This seat cover fits perfectly in our F350, and does not move at all even with the dogs moving around. It’s durable, and looks great! Highly recommend this seat cover. It is made durable great quality and looks really good. The fit in a full size truck was perfect. Works perfect in my Subaru, I was hesitant to purchase thinking it was only for bench seats in trucks but the overhang tucks in the seat and lines up perfectly. 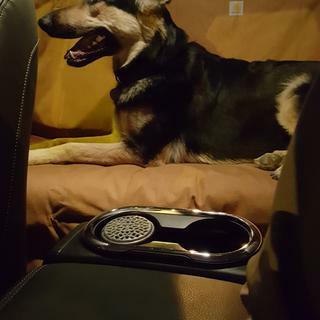 My dog enjoys sitting on it and my leather seats will enjoy getting a break. Same quality and durability of the Carhartt brand. Didn't fit my Ram 3500. I like it much better than my previous from another company, for sure, but I would really like it if you could sew two together to make a hammock! Really. The two dogs slip on the fabric a bit, but I'm sure they will get used to it! Just gotta love Carhartt, now even my two dogs do! Awesome product just needs straps to hold down the bottom portion . Thank you for your input. Your comments will be shared with Product Design. Please contact us at 1 800 833 3118 if we can provide any assistance. Durable, but doesn’t stay in place. It’s easily removable and washable which is great, and the Carhartt material will stand up to a dog’s nails no problem. I gave 3 stars because on leather seats, it will slide ALL over the place. The corner straps are not sufficient to keep it in place. I had to buy nylon straps and buckles which my wife sewed on so I could secure the bottom part to the bench seat. Fix this issue and it’s 5 stars easy. Thank you for your input. Please contact Customer Service at 1 800 833 3118 if we can be of any further assistance. The only problem I have is there is no where for the elastic straps to hold bottom down. Love this product!! Fits back seat of Ford F-150 great! We appreciate your feedback and will share it with Product Design. Please feel free to call Customer Service at 1 800 833 3118 if we can be of any assistance. We love it! Fits the backseat of a truck perfectly. Like the seat cover fits nice durability is there for sure. Has held up for me. Works quite well. Very durable. Fits great. Haven't had Rox in the truck much but that will be changing soon. Will be traveling to the Rifle River this week. Then to the northeast in Oct. Check back with us. Awesome product. Glad I purchased at the last minute since we were headed up north to let the dogs go swimming. Wish it was a 2 inches longer to fit my 2016 Ram Crew Cab bench seat. Otherwise awesome. Day 1 and it's already Hatcher Heaven. I always worry about things fitting and what they will look like, when I order on line. On top of that I work for a pet supply store and we don't carry this product. I will tell you I'm very happy with the way it fits and looks. In fact I had a coworker go out and look at it and she is ordering one for her SUV. We are pleased to hear that you are happy with your purchase. Thank you for choosing Carhartt. Iconic. Carhartt does it again with quality fabric. Great product! Water resistant would be a welcome improvement as long as it's still washable.. This product is excellent. It fits our MKX perfectly and is so easy to put on and take off. The quality and color are so rich and wonderful! This was a great value! "one size fits all. Since the rear seat is only for 2 persons I was afraid it would be too big. But it tucked in on the sides and back just fine. Fits well and is more durable than others of a similar variety with the look that Carhartt is known for. Fits perfectly in a 2017 Nissan Titan, and Pepper loves it. Love this! Fits great in different types of cars. This is truly an amazing piece by Carhartt! We have a Subaru Cross Trek and a Tundra and the cover fits well in both cars. Fits well into the bench seat and it meets my expectations of the quality of your product. Can this be draped over a folded up bench seat (essentially keeping the bench covered but the back of the ab open for dos to walk around) ? Trying to keep dog hair/drool off the bottom of the bench and off of the exposed leather is impossible. BEST ANSWER: Yes it can... it probably even works better that way. The tie downs on the corners of the cover are pretty much useless. I had to get the upholstery shop that did the leather in my F150, to add some Velcro straps to actually hold on on the seat. Yes, but you would have to find some way of strapping the seat cover down, maybe a bungee cord or what have you. The seat cover is all one piece and it is secured at the top with a couple of straps that go around the head rest. The cover is made of the same material they make their work pants and coveralls out of so it is good quality and will last longer than the truck. I personally feel like it would work just fine for that, They are quite long, If you had the bench seat flipped up it would more then likely drape onto the floor of the vehicle too, I have a megacab and it more then covers the whole back seat with lots hanging over the edge. I really like it. Yes, I purchased some hiking straps to help to keep the cover at the fold of my 2018 Silverado with leather. It works much better than the one I bought from a competitor , highly recommend. It can be draped over a folded seat. There is nothing holding the cover in place between the back and bottom portion of the cover. Yes it can. I added a velcro strap to mine so I can use it in another vehicle aside from intended one. Pretty versatile. How are Carhart seat covers with dog hair? Every seat cover I have bought is like a magnet for dog hair, impossible to vacuum up. BEST ANSWER: It is great, the dog hair barely sticks and is very easy to vacum up and good quality for their nails and rough paws. Only thig i did not like is the straps on the bottom don't work very well keeping the bottom in place. I had to sow on a couple but that was easy. I'm happy with it otherwise! Can this work in a 1985 Chevy Silverado with a bench seat? BEST ANSWER: The measurements of this will be 51"L x 51"W.
They work on all bench seats. BEST ANSWER: This seat cover is a one size fits all, and measures 51" L x 51" x W. We recommend measuring your seats to see if they will fit your vehicle. Doesn't this come in grey? BEST ANSWER: This only comes in the Carhartt Brown color at this time. We have forwarded this over to our product team as a suggestion. I would like Grey too since I want to ordered the matching for my seats front rows on my truck. Will this be offered in Gravel by chance? Or even Black? BEST ANSWER: We currently only offer this style in the Carhartt Brown color. We have forwarded this to our Product Design team as a suggestion. BEST ANSWER: We expect more stock in early-mid July. We had the back seat cover in my f150 and it seemed to work great!! Only issue we had was the bottom straps didn’t seem to stay and our heelers always tried to ruffle it up. So we used little bungee cords to hold the straps on the bottom down better and it’s been excellent ever since! We now have it in my f250 and had to do the same thing, other than that, we absolutely love it and it protects the seat well!! can't speak to the access cab fitment ( it fits my f150 like pictured) so its likely going to provide a few inchesmore coverage on your seats width-wise and possibly hang down to the floor in front. Not sure about the Tacoma but it fits out Lincoln MKX perfectly. The straps are adjustable and was best purchase for the car. I take it out and vacuum it once a week and wash periodically. Great quality! my silverado has the rear bench cover and bucket seat covers which all fit perfect. these covers will save my leather seats. highly recommend . i have machine washed them with no problems. I have mine in a 12 F150 extended cab and it fits just right. I could use it in the ront but wouldn't be ble to put the middle console down. Not sure about the Tacoma, but fits perfectly in the Tundra. DOES THIS COVER HAVE AN OPTION FOR CHILD SEAT LATCH TO BE USED WITH A CAR SEAT? The seat belts fit through the cover. Should be able to attach a child seat. Would it fit a 2008 ford f350 bench backseat? BEST ANSWER: The measurements are 51 L x 51 W.
Yes. It fits my silverado 1500. And seems to be a bit large actually. Would surely fit a Ford F-350. I would assume yes..? It fit my 2013 F150 bench back seat and Im not sure if the 350 back seat is any bigger. It’s a Christmas present for my son so still in box - will let you know the size when he opens it. Fits the rear bench seat of my Silverado just fine. So far love it. My son loves it and it fits his gmc Denali perfectly! Does this have slots to hook up a car seat by chance ? BEST ANSWER: Yes there are openings for the seat belts which line up with the car seat hooks. Currently have a Graco car seat in my Silverado 1500 and it’s secured properly. Yes it has 2 big ones for seat belts. It does not. Only for seat belts. Does dog fur stick to the material that makes up the shell of the dog blanket? BEST ANSWER: No, not like it does to the carpeting in your vehicle. To clean it off, I usually take it out and shake it off... then use a shop bag to get any fur left behind. I love the cover but I have a truck with a super cab. This means 3 seats in the back row. The dog cover only allows access to the two outside seat belt receivers, not the middle. Other than that, the product is perfect and well worth the money! Yes, it’s the same material as the jackets. It’s not a slick material. It doesn’t stick to bad but it does some. I have a chocolate lab. I just take it out and shake it out occasionally and most of it comes off. I’ve had a few different dog covers and I like this one the most. Yes it does which at first can sound like a bad thing. After owning it for a while and using it for a black lab I’ve found that with a quick run through the washer it cleans right up. And that is better than it blowing or falling all over my truck. I have 2 short haired dogs and their hair kind of sticks to everything, including this seat cover. It vac's off easily though. It also comes of easily if you have to put real people back there. Yes. Both sides. Dog fur sticks to everything and anything. The cover does protect your seats. Does it cover whole seat on 2017 F350 Crew cab? BEST ANSWER: It covers about 90% of it. Would be nice if it was about 6” longer in width on the seat part to actually fully cover the edges of the seat between the seat and door. Yes it is long enough and tall enough to cover it completely. But does not cover sides of seats or front of seats just the main seating area and back rest. My back seat in my F150 has a seatbelt in the middle and both sides, like most back seats, I can see from the picture the side ones are easy to use but can you still utilize the middle seatbelt with this cover on? BEST ANSWER: Yes, you should still be able to use the middle seatbelts as well. I have a 07’ Dodge Ram. My middle seat belt is a 3 point belt, it does not work with the cover. If your middle belt is a lap style belt it should work just fine. I got the cover because of my dog, if I’m gonna have 3 people in the back the cover comes off in 30 seconds. Hope this helps. The middle over the shoulder seat belt does not work with seat cover in my Toyota Tundra Extra Cab. If you have just a lap belt that would work as there are holes in the center of the cover for belt buckles. Yes, I can use the middle seat belt on my F150. You have to dig a bit.... but there is a large opening for all the seatbelts. Very tough cover. I love mine. Will it fit correctly in a 2010 chevy Silverado? BEST ANSWER: It's fits in my 2001 Tundra with a little extra material to spare--hope that helps! Yes it will. That's the exact truck I use it in and it works great! Yes it will fit any bench seat! Does this have anything to keep the bottom tucked On into the seat back? Also I second adding black and waterproofing them. As well as adding covered zippers so we can utilize split seats if needed. BEST ANSWER: There are adjustable straps with buckles to secure the seat cover over neck rests and elastic straps near the bottom corners to keep it in place. There are two slots, like giant buttonholes, along the middle where the back of the seat meets the bottom of the seat and this is where seatbelts would pop out, those help hold the seat cover in place as well. Nothing to keep the back tucked in. I literally fold my seats up and stuff the excess in there. I have a 90 pound pit and she doesn't make it pull back out. It just stinks because I have 60-40 split bench so there is so seperator bar I can't get around. But for $100 it sure beats any other hammock or seat cover. As for the material it is water repellent I believe and 90% of the time I have the cover on to throw tools and dirty crap on. The dog is only the 10% of the time. It also only takes about 30 seconds to put in and even less to take out if you want to use the seats. I agree black would be cool and waterproofing would be helpful if you are inclined to let messy stuff in your cab. Zippers would be a nice touch. I manage quite well with my cover considering I don't let children anywhere near my truck. The seat belt buckles kinda hold it into the right angle of the seat. It could be better. There are straps along the bottom near the edge but they don't have anywhere to strap in, at least not in my 2015 Tacoma. How are the elastic straps on the bottom used? There isn't a spot in my car to attach the bottom straps, but the cover still stays in place without them. They cant attach to anything. There is so much high quality carhartt cloth that its really not a issue. They are a hook and loop system, you use the elastic straps to fold it under the seat! Could you please make a hammock style cover that goes from one head rest all the way to the floor for when my passenger seats are folded up in my F150? I like the cover but it lacks straps for the bottom of the seat cover. My Yellow Lab moves around a lot and the cover won't stay in place. Another cool feature would be straps on the front edge of the seat cover to loop over the front seat headrests. This would keep the pooch and their bed on the backseat during quick stops. Not my idea, a few other companies making covers use this four headrest strap attachment solution. Would this be possible? I like the cover but wish it had straps on the front also.The cover will not stay in place when the dog jumps in and out of the truck or moves around on the back seat. It would be nice to attach it under the back seat somehow. That maybe a great idea for someone that has small dog, but my dog weights over a 100 pounds. I would be concern she would pull on the headrest. Thanks for asking. I see several dimensions for this in the answers below. What is the size of this really? BEST ANSWER: The official measurements are 51 L x 51 W.
BEST ANSWER: The product measures 51" L x 51" W.
Yes. Basically just lays over the back seat area, and has buckles to loop around head rests. May be big for a Honda sedan, but not overly so. Fits our Toyota 4Runner great, and is super easy to take off and put back on when seat is needed for human transport. This cover will work. I bought mine for my Colorado. It is currently in the shop for repairs, so I moved it over to my rental, which is a Ford Focus with no issues. If you do have any overhang, it will easily tuck away around your seat cushions. It's slightly too small for the rear bench seat in my 2016 ram 1500, I imagine it working well for your Honda as long as there are headrests that you can latch it around. It might be a little big for a Honda Accord, but I think it would work pretty well. We used it for a big Chevy truck and it fit pretty accurately. I am not sure I would fix your Honda Accord. This item worked great for the back seat of my Subaru Outback. I would thinks so. I wrote a review (see on website) for a 2 door jeep and it worked just fine. Will this fit a 2015 Toyota Tacoma extend cab rear seat? BEST ANSWER: Yes, this style is a one size fits all. It measures 51"L x 51"W.
I WOULD REALLY LIKE TO HAVE THIS IN A WATERPROOF VERSION... AND ALSO IN ANOTHER NEUTRAL EARTHTONE COLOR... SUCH AS GREEN, GREY OR A BROWNER BROWN? BEST ANSWER: We'd be glad to share your feedback with Product Design. I'd also like to request that Carhartt offer this the cover in black. Please?? BEST ANSWER: This style is not waterproof or water repellent. I believe they are not. 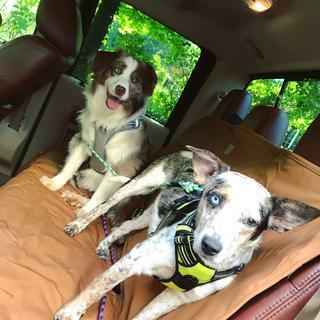 I have two in my trailblazer and one day my Sadie chewed a bottle of water and it leaked all the down to the hidden compartment below the dog cover. But I do really like them. They are worth the money. My bench seat does not have head rests, will this cover still work? BEST ANSWER: This seat cover would work best on a bench seat with headrests. It features straps that are meant to secure over the back of the headrests. i second the request to have this offered in black...? Black will match darker color style interiors. I second the black color. It can also hide any small dirt or stains from the dogs paws from walking in the dirt. Will/Can this product be made in any other color? Possibly black? BEST ANSWER: We apologize we only offer this style in Carhartt Brown. We appreciate your feedback and will forward your suggestion to our Product Design Team for future consideration. will this fit a full size 4-door truck seat? BEST ANSWER: This style measures 61 inches wide (25.5 inches from the back of the seat to the end of the cover) and 57 inches from door to door. This is a One Size Fits All. BEST ANSWER: Yes, they are. The care instructions are as follows: Machine Wash Warm - Like Colors. Do Not Bleach. Tumble Dry Medium. Remove Promptly. Steam Iron Shell Only.